The title track ‘Ice cream is said by Musicman-NET to be a party-rock tune, and the new single cover, which was posted by TEEDA on his latest blog post just earlier (so did the staff), has now made its way onto the band’s official discography page. In addition, Musicman-NET also shared a brand new promotional photo of the band – shown below – featuring some seriously heavy eyeliner; even our lovely Shu has undergone a revamp with his new slicked-back hair! The article talks about BACK-ON‘s recent work, including TEEDA‘s collaboration with Koda Kumi (aka. Mrs Kenji03) on her 50th single “Poppin’ love cocktail feat.TEEDA“, as well as KENJI03 and TEEDA‘s performance on a-Nation, says that this is one of most anticipated releases from the band, and that the band will be performing their new songs at their forthcoming tour in June! But look forward to this release! @Sesshy: I concur re: Icchan. I noticed the airbrushing done to the previous ‘group’ photo on the ‘connectus and selfish’ edition and it was a wee bit haphazard. I remember they said about not finding a replacement straightaway… wonder what will happen over the next year or so. 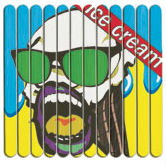 I am looking forward to this release too :) “Ice cream” is meant to be a pop song apparently – said the Good Job!! blurb – so I wonder what PIECE will be like?